Interest in community benefits has been growing in Ontario over the last few years, as a way of ensuring that public and private infrastructure investments foster prosperity and well-being in the communities where those projects take place. 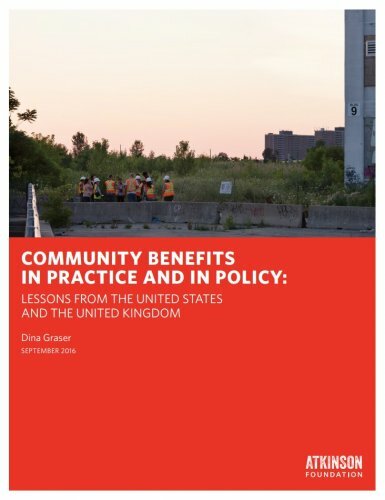 In October 2015, Dina Graser was contracted to research how community benefits could produce meaningful change for low-income communities, and to make practical recommendations as how to best advance the field in Ontario. A review of community benefits agreements (CBAs), “social clauses,” and legislation and policies in the U.S. and in the U.K. This was done to understand the legal, procurement and political frameworks in which they were created. Interviews with a wide range of experts and actors in the field of community benefits in the U.S. and the U.K.
A study tour to California with Colette Murphy, Executive Director of the Atkinson Foundation, to better understand the “ecosystem” that makes community benefits projects and policies possible there. The tour included meetings with leaders in the nonprofit and community sectors, staff in city governments and public agencies, economic development experts, organizers, workforce development pioneers, academics and policymakers in Los Angeles, San Francisco, Oakland and Berkeley. This report summarizes what has been learned through those activities, analyzes the state of play in Ontario, and makes recommendations as to how best to further this work in our own context. Concluding Thoughts on the U.S.